Abu Dhabi: Graves dating back to 2000BC have been unearthed during the construction of the Shaikh Mohammad Bin Zayed Road project in Ras Al Khaimah, Gulf News has learnt. The Sieh Al Herf site, next to Al Salhiya Road, just off Shaikh Mohammad Bin Zayed Road in Ras Al Khaimah, was discovered in October. It contains graves, ancient tombs and archaeological artefacts. The Shaikh Mohammad Bin Zayed project passes by about ten features of the archaeological site, including two graves. The first is an 18m-long horseshoe shape, and the second is W-shaped. Other tombs are still under investigation. The Ministry of Public Works has halted the road-building until further orders following a request from Ras Al Khaimah’s Al Shohooh National Heritage Association. An official told Gulf News that Federal National Council (FNC) will send a team to investigate the matter for further course of action. Shaikh Mohammad Bin Zayed Road, earlier known as Emirates Road, is one of the strategic routes in the UAE’s land transport and road network. “Sieh Al Herf contains several graves and tombs that demonstrate the history of the Arabian Peninsula and date back to the year 2000BC. 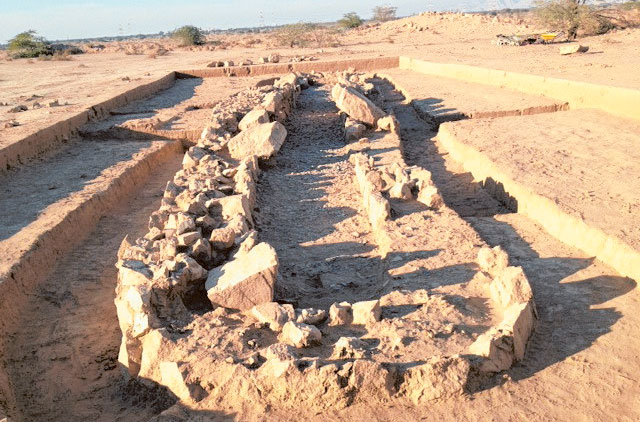 So far only three such historical graves have been found in the UAE, two in Ras Al Khaimah and another one in Fujairah,” said Hamad Bin Seray, associate professor in the department of history and archaeology at UAE University. “Different UAE authorities should shed light on the history of the region and provide the public, within the country, with cultural information to highlight the heritage of the country and its historical civilisation,” he added. Seray also pointed out that removing the accumulated layers of mud on the excavation is a real responsibility rests on the shoulders of various competent authorities in the UAE. “Although completing the Shaikh Mohammad Bin Zayed road project is significant to facilitate trade, traffic and tourism activities, preserving the country’s heritage is also essential. Thus, building a bridge or transferring the road by specialists and engineers can be another solution to rescue such historical antiques,” Seray told Gulf News. “Several archaeological surveys and more cooperation between authorities and administrations should be encouraged to promote tourism,” Seray added. Abdullah Bin Lagious Al Shehi, chairman of Al Shohooh National Heritage Association, said: “The emirate of Ras Al Khaimah has a rich cultural history as well as remarkable archaeological sites. Therefore, protecting such historical graves and continuing to explore more antiquities is considered urgent to preserve and protect Emirati culture.